Diesel locomotive Sik of the Dutch State Railways. Between 1934 and 1951 the Dutch State Railways bought the 2-axle diesel shunting locomotives from the manufacturer Werkspoor. One series of the locomotives was also delivered by CW Zwolle. 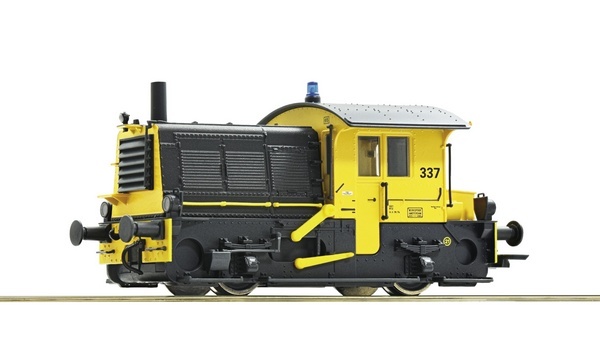 A total of 169 locomotives were built, but in various series and slightly different designs. The locomotives were known for their striking exhaust noise and as a result railway workers and railway fans call them "Sikken" or "Sik" what means "Goat" in English. Fifteen of these locomotives were delivered with mobile cranes. After the original green livery later the yellow-grey colour scheme was applied. The diligent working horses made unremitting efforts when operating throughout the Netherlands. In the second half of the 1990s, stricter safety regulations led to the decommission of the remaining locomotives. Many of them are preserved or still in operation at museum railways and some private railway companies.